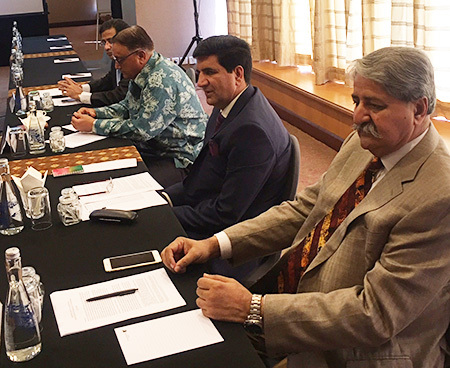 July 17: An eight-member Pakistani delegation facilitated by PILDAT and led by Senator Mushahid Hussain Sayed, Chairman Senate Committee on Defence started off a study visit to Indonesia today spanning from July 17 to July 20, 2017. 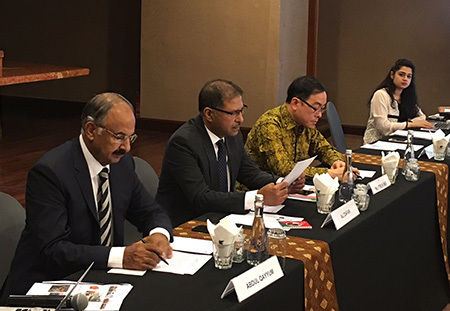 As Pakistan and Indonesia share many common traits, including the journey towards democratic consolidation from military rule, the purpose of this study visit is to seek a deeper understanding of democratic consolidation in Indonesia just as Pakistan has begun its own longest uninterrupted spell of democratic governance in 2017. The delegates attended a lecture today by Honourable Mr. Jakob Tobing, who is one of the most prominent architects of the new democratic Indonesia. He played an instrumental role in Indonesia’s transition from the authoritarian rule to democracy in 1998. Mr. Tobing gave an introduction to the making of the original 1945 constitution. He highlighted the reform process and its outcomes which included a constitutional democracy, rule of law, a check and balance mechanism, human rights, separation of religion from the state, a unitary form of government, devolution of powers, elections and most importantly, civil-military relations. The PILDAT delegation includes senior Parliamentarians, representatives of major political parties and members of PILDAT Dialogue Group on Civil Military Relations.